Juliette is enjoying our new swing! And I am enjoying how this dress turned out! I spoilt myself a couple of weeks ago and filled my cart with some beauties from Hawthorne Threads. I do love black floral and this one is so sweet - with pink, white blue and mustard little flowers. The fabric is called lush in black and it was designed by Limona Siminovich for Cloud9. 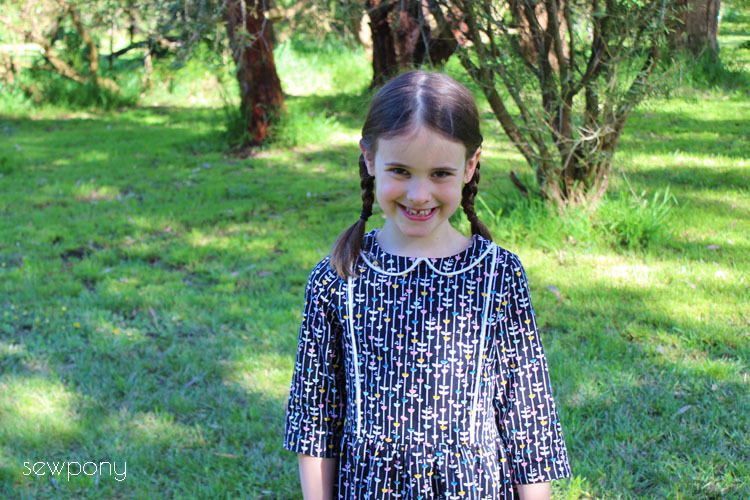 Since beginning testing of my new pattern -the tic tac toe dress, I have added three quarter and long sleeve options. I have also omitted the flared sleeve option as they only sat well in very light weight fabrics. So, I really wanted to try out the three quarter sleeves with my tic tac toe dress and this fabric was begging to be chopped and piped! I included the half collar, pieced bodice, plain skirt and V-back. Juliette is my biggest dress lover out of my three girls. She will often come home from school and disappear to get changed and come out in a mummy made ensemble. Phew! 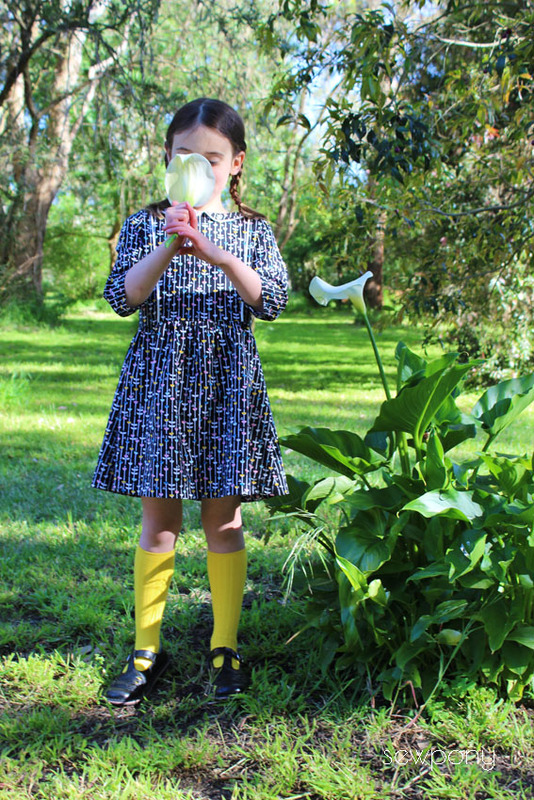 I feared school uniforms may be the end of my dress making obsession! 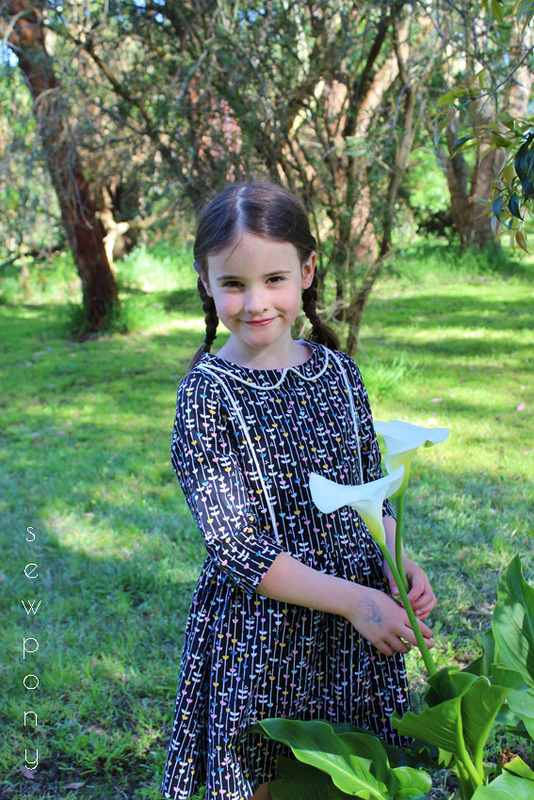 Juliette is also a reliable test model as she falls into all of my size 6 measurements...although she is creeping up to size 7 in height which is why this dress is a little shorter than intended - but I like it this way! I've not used white piping before, but it really pops with this print and was the logical choice to tie in with the white vines. The sleeve lengths looks uneven in the photo above, but they aren't...promise! 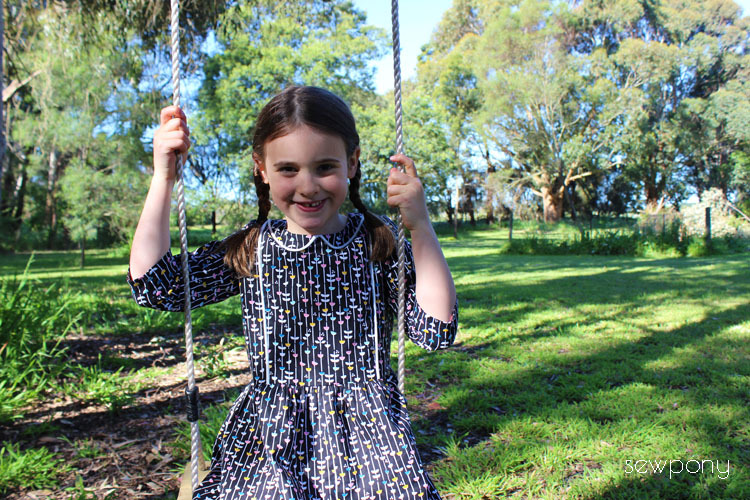 I hope you are excited to make a tic tac toe dress soon? The pattern will be ready this Thursday! 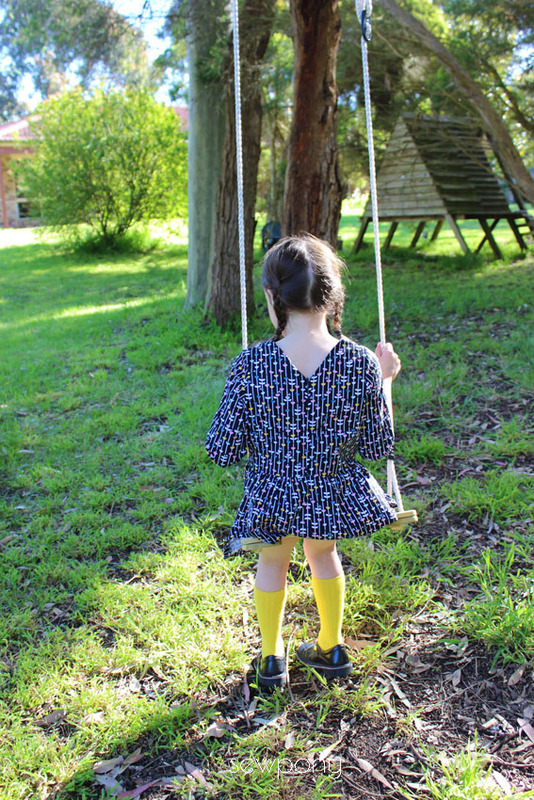 Thank you Issie for loaning your sister your school shoes for these photos!! I love this 3/4 sleeves version! I think the length is perfect for your daughter. She is so beautiful! The dress looks so pretty <3 Piping works really well with the main fabric :) Such a great pattern Suz, perfect for any season indeed! Thank you Jenya for all your help!